Almost every Friday night is homemade pizza night at our house. This week it came together very quickly thanks to some shredded chicken we had in the freezer* and store bought ranch dressing. Set out pizza dough an hour before making the pizza (we find this makes the dough a lot easier to stretch). Preheat oven according to directions on pizza dough (Portland Pie Co. is 475°). Dust flour on pizza stone and stretch dough. Preheat a pan with a tiny bit of olive oil and throw in spinach for a minute to wilt down. Spread a little bit of ranch on the dough with the back of a spoon. 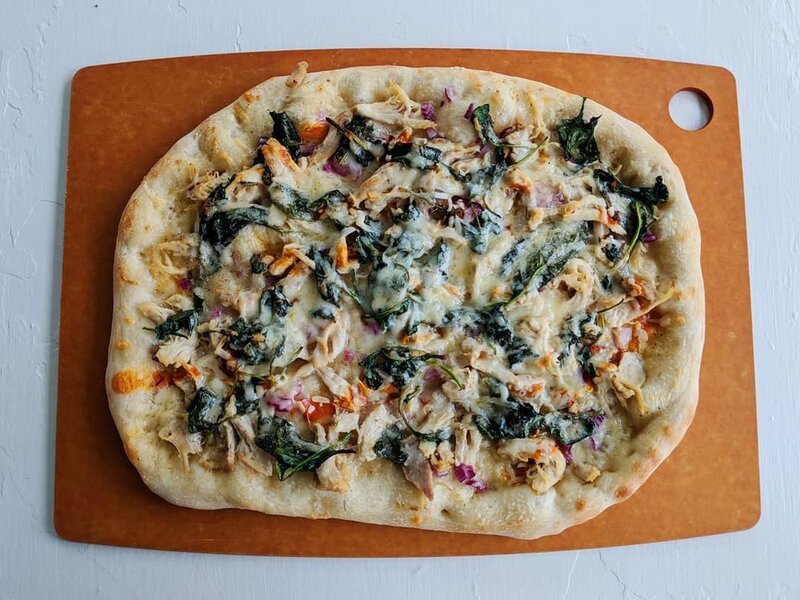 Distribute the chicken, spinach and red onion over the dough. Drizzle Frank’s RedHot and more ranch. Top with cheddar. Bake according to package directions (in our oven it takes about 14 minutes to get the crust golden brown on the bottom). Slide onto a cutting board and let cool for a couple of minutes before slicing and serving. *We cook a couple of pounds of boneless chicken breasts or thighs using kitchn’s method “How to Cook Moist & Tender Chicken Breasts Every Time”. I skip the flattening step and get great results every single time. Then, I toss the chicken in our KitchenAid mixer with the paddle attachment to shred it and freeze in one or two cup servings. This makes recipes come together quickly because all we have to do is throw a bag of chicken in the fridge the night before to thaw.